Indonesia had been tapping the rich diversity of its archipelago in dressing its Miss Universe contestants for the National Costume contest. Since 2005, Indonesia had utilized the unique and visually appealing costumes that comes from its Western Papuan frontiers up to the hinterlands of Borneo. Such diversity gives the country so much edge and it is gaining a lot of attention with regards to this matter. For example, in 2012, Maria Selena’s costume was voted as Top 10 Best in National Costume in in 2013, Whulandary Herman landed in the 4th place! In 2005, Artika Sari Devi wowed the audience with her Balinese costume complete with frangipani headdress. The rich patterns in her silk skirt is truly opulent and the design exudes the uniqueness of the Hindu enclave in a predominantly Muslim nation. In 2006, Nadine Chandrawinata brought the Indonesian National Costume into the spotlight after she won second place to Kurara Chibana’s famous samurai costume. Nadine looked fabulous in an Anna Avantie designed costume based on the mythical character Ratu Kencono Wungu or literally Purple-formed Queen. The Dayaks of Borneo got an international exposure in Agni Pratistha’s National Costume. The design is similar to what Vania Larissa’s costume at Dances of the World in Miss World 2013. The fabric design is endemic to the Borneo island and the feathers represents the close relationship of the Dayaks to the jungle that surrounds them. 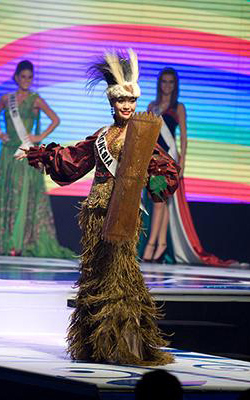 The choice for the 2008 National Costume went east as Putri Raemawasti used a West Papuan costume. The design and fabric is a departure from the usual that we have seen from Indonesia. In 2009, Zivanna Letisha Siregar took a cue from the Javanese shadow puppetry called wayang as she donned a costume from one of the characters. This costume shows the heavy influences of Hinduism and Buddhism in Indonesia culture. Using the theme Kecantikan dari Rimba Raya or Beauty of the Wilderness, Qory Sandioriva used a Papuan costume once again at Miss Universe. The costume used feathers and frilly skirt complete with sea shell and crocodile teeth necklaces. In 2011, Nadine Ames used a costume that takes inspiration from the wooden puppets of the Sundanese in the West Java. The theme of her costume is called The Beauty of Wayang Golek. Maria Selena in 2012 made some news in Indonesia after being hailed as the Top 10 in the Best in National Costume contest. The festive dress that Maria used was derived from the country’s coat of arms which is called as Garuda Pancasila. The mostly red and white colors of the costume also reflects the colors of Indonesian flag. In 2013, Whulandary Herman wowed the Russians with her colorful and unique costume inspired by the East Javan dance called Reog Ponorogo. Whulandary looks carnival-esque in her lion-peafowl mask and costumes and perhaps the reason why she won as 4th Best in National Costume. This 2014, what kind of costume will Elvira Devinamira will wear for Miss Universe? Maybe a Bugis costume that is simple yet unique. Or maybe an ornate and Maleficent-esque costume of the Minangkabau. The choice from which Indonesia can pick its inspiration is endless. But, whatever that choice may be, it will surely be unique and something that reflects the diversity of the nation. And what is so great about Indonesia is that the Indonesian themselves are the ones that create and design the costumes.